The new proposals show that Simons have listened to the criticisms made 18 months ago. It is however difficult to understand why in 18 months they have only produced such sketchy plans and have not consulted with the market traders before the exhibition. Simons staff were quite open that M&S and Debenhams had been approached as possible tenants of the anchor store. The impression given was that neither had made a positive response to that. Undoubtedly Simons are in touch with both companies as they have other developments sorted or proposed around the country, but there seems to be no evidence that either company is other than aware of this proposed development. The Simons staff said that this development could not go ahead unless such a company was signed up as a tenant. Given the lack of commitment so far, and the current retail environment, the probability of this scheme progressing seems minimal. Simons have asked NHDC for an 18-month extension to the Development Agreement signed in 2010, but if there is a further 18 months of blight on alternative schemes, and a further time of uncertainty for the market traders, it seems inevitable that an extension of the contract will have an adverse effect on Hitchin retailers, traders and Hitchin Market Limited. It appears that Simons do not have the resources to proceed with the development as we understand they have now asked NHDC to contribute £2.1M. “Anchor” store tenants want everything done to their own specification – both in terms of the building and the fitting out, plus 8 years’ free rent for signing a 10-year lease (which is what attracts other tenants to the development) and a payment of £2M upfront. Should North Herts taxpayers have to fund something that many people in Hitchin don’t even want? The illustrations are highly misleading and do not correspond with the ground plans. 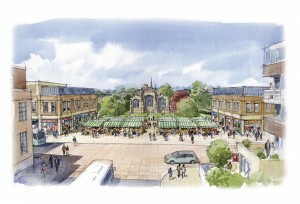 The increase in space between the buildings on St Marys Square allows a better view of the church from Hollow Lane, but the artist’s impression shows a vista which would not be visible at street level. 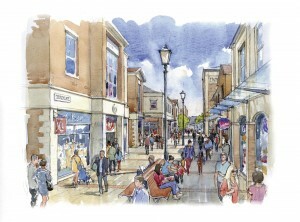 Simons did not discuss these plans with Hitchin Market traders before publishing them and it shows! The plans do not show adequate space for the permanent stalls we currently have; they are proposed to be placed in ‘shopfronts’ either side of the demountable stalls. However, these would be ‘prime retail’ units and it is unrealistic to expect an anchor store to give up its ground floor frontage to market stalls or market traders to pay such high rents. Further, a more realistic illustration would reveal that even demountable stalls would stand in the view of the church on market days because the church sits at a much lower level. Simons have not allowed for any increase in parking in spite of increasing retail space by 30%. The plans also indicate that all four of the existing car parks – Biggin Lane, St Mary’s Square and Portmill Lane east and west – would be centralised into one multistorey on the corner of Queen Street and Portmill Lane. This car park would be privatised. That means there could be no local control over car park charges. Cheap car parking is fundamental to the health of the High Street so this seems a retrograde step. Unlike the existing surface car parks, a new multi-storey would almost certainly be closed at night, threatening the future of Hitchin’s thriving pubs and restaurants. The hotel proposed on the former Post Office site would also be dependent on car parking being available 24 hours a day. These plans are only ‘concepts’ at this stage, but they have been scaled down from the previous ones. However, the built form indicates buildings that do not reflect their historic surroundings, nor do they do justice to the setting of our most important Listed Buildings – St Mary’s and The Biggin. The size of the ‘anchor store’ building would totally overshadow the 14th century Biggin to the southwest of it. The current views of St Mary’s from either side of Hollow Lane along Queen Street would be totally obscured by the buildings. Will more chain stores make Hitchin more attractive to residents or shoppers? The developers talk about reducing ‘leakage’, that is, shoppers shopping elsewhere, but that is the nature of shopping. It is important that Hitchin’s character as a leisure shopping destination, full of historic character and independent retailers, is not overshadowed. Blight, blight and more blight . . . It has been nearly 2 years since the last meeting of the Churchgate Liaison Forum, so why has it taken Simons all this time to produce further plans? (The consultants at the exhibition said they spent just 10 days preparing them for the exhibition.) Simons want an extension of 18 months, but in all this time retailing has fundamentally changed, with shops downsizing and closing nationally and internet shopping increasing. Hitchin thankfully has a vacancy rate much lower than most, but continued uncertainty brings with it blight. The market, for example, has not been able to get grants for improvements because the Council will only give them a short-term lease. Are these proposals not out of time in retail terms, still out of scale architecturally, and financially not viable?